Along with bundling up constantly, what we dread the most about cold weather is the maintenance our skin requires to stay healthy and moisturized. Everyone hates when the skin starts to flake and lips become chapped during the winter months. Say goodbye to cracked skin, flakiness, itchiness and dryness because we have found the perfect product to solve all cold weather problems! The First Aid Beauty Ultra Repair Cream Intense Hydration is a head-to-toe moisturizer that will keep skin just as happy as it is in the summer, all year around! 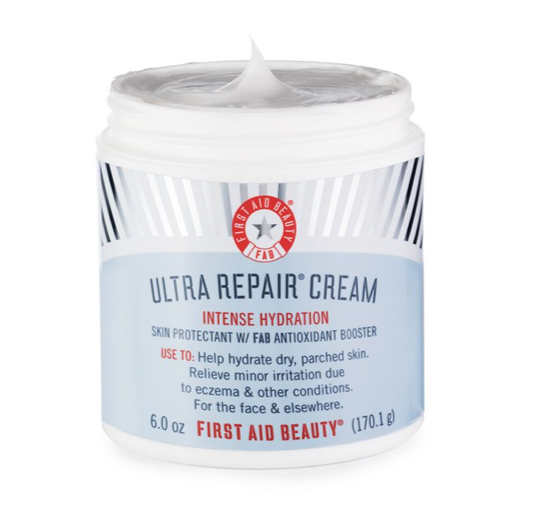 See It: Grab the First Aid Beauty Ultra Repair Cream Intense Hydration for $32 on Amazon now! Not your thing? Try other moisturizers available at Amazon! Please note, prices are accurate at the date of publication, January 8, 2019, but are subject to change. The cream helps with instant relief and long-term hydration for dry, distressed skin. With intense hydration, it almost immediately restores thirsty skin to a visibly healthy, well-moisturized state. Complete with a nourishing shea button, the First Aid Beauty antioxidant booster and eucalyptus oil, it helps with flaking and irritation from eczema, psoriasis, keratosis pilaris and dermatitis. The oatmeal extract leaves a protective film around skin to prevent flaking and dryness while the antioxidants repel from free radicals to prevent future damage. The allantoin helps to deeply soothe skin and alleviate irritation and eucalyptus oil helps speed skin recovery and also alleviates inflammation. First Aid Beauty’s promise is all about formulating its products with only clean, skin-loving ingredients. The brand actually has a list of over 1,300 ingredients that it doesn’t use so you can be sure that you are putting pure goodness on your body. Some ingredients it steers clear of are artificial colorants and artificial fragrances, parabens, ethanol, ethyl alcohol, denatured alcohol, methanol, n-butyl alcohol, isopropyl alcohol, sd alcohol, lanolin, propylene glycol, phthalates, mineral oil, petrolatum, formaldehydes, oxybenzone, coal tar, hydroquinone, triclosan, triclocarban, talc, and sulfates. You can use this product on both your face and body and it’s so gentle that even children and babies can use it! The whipped, creamy, texture is thick but light, smells like eucalyptus and absorbs quickly into the skin without the greasy after-feel. While most skin care products are almost never one size fits all, this moisturizer is as close as you will get – and that is no small achievement. This product will help with eczema patches, beard burn, retinoid-induced raw spots, chafed limbs, chapped nostrils – you name it, this product will fix the problem! No matter what skin type, we all should see positive hydrating results from the very moment the product touches the skin. First Aid Beauty stated that after using the Ultra Repair Cream Intense Hydration, one hundred sixty-nine perfect of people see an immediate improvement in skin hydration, one hundred percent reported a lasting improvement in skin dryness and another one hundred percent found that the product helped soothe, moisturize and condition skin. Shoppers with dry skin said that their skin stays hydrated longer with this cream than with any other products they’ve tried on the market and they almost always turn to the Ultra Repair Cream over any other product they own. On the other end of the spectrum, people with oily skin also highly recommend this moisturizer! One user with oily skin said this cream keeps skin healthy, soft, and supple without breakouts and helps diminish acne scarring. While the majority of the reviews online have only extraordinary things to say about the moisturizer, a few people mentioned that the lotion does dry a bit too tacky to wear underneath a full face of makeup or under sunscreen. Therefore, if you’re intending to use this cream on your face, we recommend using this product on a freshly cleaned complexion before going to bed, on a weekend free of makeup or a few hours before applying cosmetics. Another huge factor that has made a huge difference for many people is the fact that you get an immense amount of product for the price. The standard 6-ounce jar is $32 and if you are really loving the cream, you can purchase a large 8-ounce tub for $38. If none of those prices sit well with you, you can purchase a small tube (2 ounces) for $12. Plenty of shoppers have stated that the 6-ounce jar has lasted them well over six months, whereas many other hydrating creams in the same price range and same size container would have been cleared out by the end of one month. If all of this isn’t enough to entice you to try this life-changing hydrating cream, then maybe the fact that it was an award winner for Allure’s Best of Beauty in 2016 and thousands of people have claimed the cream as a holy grail product in their skin care routine ever since. Start off the new year with a perfectly quenched complexion, we dare you!